Occasionally, you may want to print 3D objects or models that are bigger than your 3D printer’s build area. If the model isn’t made of smaller parts, you can print oversize objects by cutting the model into sections sized for your 3D printer. This process is much easier than you may think. 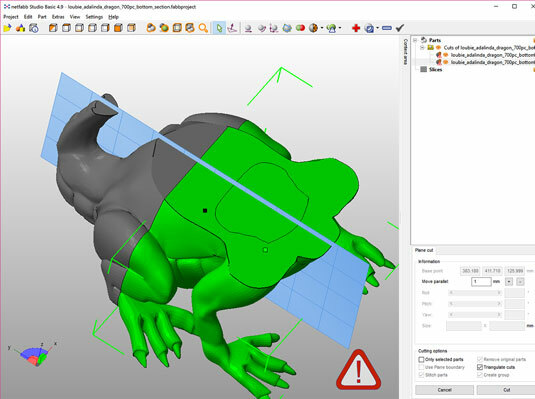 You can use several free or open-source applications to split a model into smaller sections. 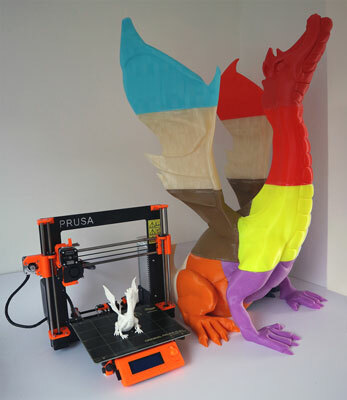 The following figure shows the use of Netfabb to cut a scaled-up dragon model into smaller parts so that it can be printed on a standard Prusa i3 MK2 3D printer. A large model in the process of being cut into sections. 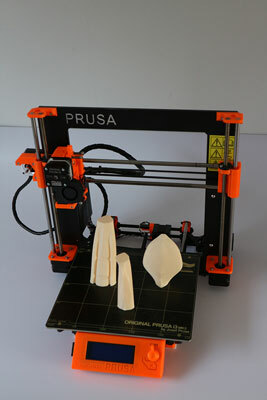 The model is first scaled up by 600 percent so that the final assembled model will stand 883mm tall rather than 147mm. Sections of the tail scaled up 600 percent and cut into sections, then printed as a plate of parts to be glued back together after 3D printing. When using an application like Netfabb, you can load in an STL model and alter the scale of the model by clicking on Part-Scale. After scaling up any model, you can then select a cutting point in the X, Y, and Z planes. Perform the cut and as you see the warning triangle in the bottom right of the screen ; remember to repair each section using the + Icon repair tool before saving each part as a separate STL file. The sections of any model you cut up still need to be printable, so you may need to rotate sections both before and after cutting in the X, Y, or Z planes. Whatever flat sections you end up with need to be rotated flat to the build platform. Netfabb has an easy Align-to-Bottom-Plane tool for automatically rotating a model to a selected surface. This figure shows the almost-complete model. The various sections were printed in PLA and glued together; any seams or defects are smoothed out with flexible acrylic filler. After the parts are assembled, the object can be sanded and painted as required. By cutting a design into components, you can print very large-scale models that can be both strong and light because the honeycomb nature of 3D-printed models allows for minimal use of material. You can use many paints and fillers to assemble the parts, but some glues don’t stick to certain types of plastic. Make sure to perform a test before trying to assemble a large model. Friction welding or ultrasonic bonding of plastics can help when two parts needs to be joined. Certain materials also limit how large your components can be. ABS warps significantly more as the printed object gets bigger, for example.